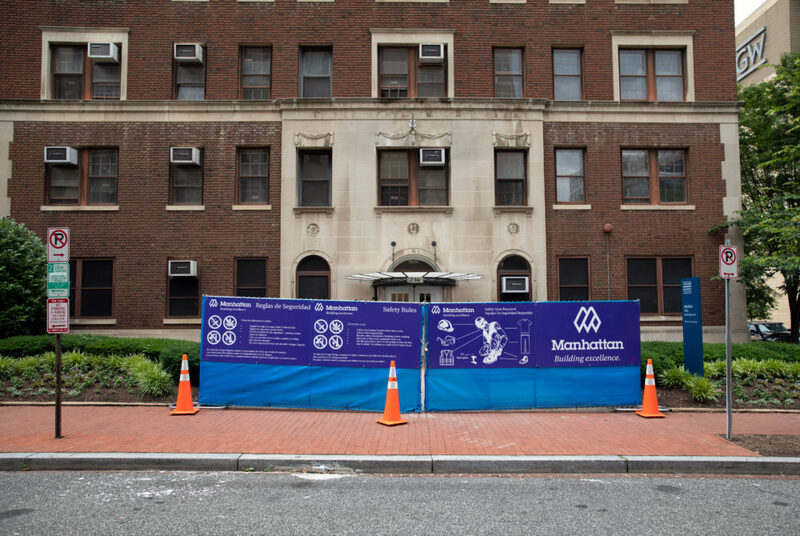 Madison Hall is one of four residence halls that is closed this summer for renovations. The University is giving four residence halls a facelift this summer. Strong, Guthridge, Munson and Madison halls closed this summer to receive upgrades, including new floors and upgraded heating units, officials said. The head of the Residence Hall Association said the updates come after students complained about the halls’ outdated furniture and facilities, including broken elevators and air conditioning units, this year. Seth Weinshel, the assistant dean of housing and financial services, said Strong and Guthridge halls will both receive new lounge furniture and flooring in each room. Munson Hall will receive replacement windows, lounge and rooftop furniture, updates to its bathrooms, and new ventilation and air conditioning units. Madison Hall will be renovated to include new elevators and upgrades to its bathrooms and sprinkler system, Weinshel said. He said there will also be a new apartment for faculty in residence to live in Madison. He said the renovations will run from May to late August – just before students move into their dorms – as part of the University’s 2014 commitment to renovate residence halls on a seven-year cycle. The University’s promise to renovate the halls was prompted by student complaints about unsanitary conditions, like mold and broken ceilings. The University allocates about $6 million each year to allow for the changes over the summer, which are typically approved by the Board of Trustees in May. “The on-campus residential experience is an integral aspect of a student’s college experience,” he said in an email. University spokeswoman Maralee Csellar declined to say how much this year’s renovations would cost. She said beyond residence hall upgrades, the University also plans to update some buildings and facilities across campus, including repairing the Lerner Health and Wellness Center pool and upgrading classroom and labs in Ross Hall. The upgrades will occur throughout the summer and into the academic year, she said. RHA President SJ Matthews said the renovation proposals were developed based on feedback from the halls’ residents at general body meetings, posts on social media sites and through a comment section on the RHA website. Members of the RHA used the feedback to propose housing changes in October and the Board approved official changes in May, she said. Former RHA President Rachel Metz said that when she began in the position last April, she started gathering student feedback on housing conditions by holding town hall meetings in residence halls throughout the year and talking to students during office hours. Metz said most of the feedback – which mostly included complaints about facilities – that the RHA received from residents last academic year was directly in line with the renovations that the group proposed to the board. “They were all things that were challenging for them, things that they wished were different in their room that would make their lives better, generally like how can we improve the amenities so when you are living on campus it feels as much like a home as possible,” Metz said of students’ feedback. Fulbright and Francis Scott Key halls shut down last summer to receive upgrades, and five other residence halls remained open while receiving minor upgrades, like new furniture. Renovations to Fulbright took longer than expected on the top floors of the building, prompting the University to provide hotel rooms for about 100 students at the start of the academic year. Former residents of the halls undergoing renovations this summer said the upgrades will make their living experiences more comfortable by fixing prominent issues, like faulty elevators and heating systems. Evan Cameron, a sophomore who lived in Madison Hall last academic year, said elevator upgrades are the most pressing issue in the building because they often broke while he was a resident. “I’ve had times when I have class that’s a two-minute walk away, and it will take me 10 minutes to get there, just because I was waiting for the elevator,” Cameron said. Kate Donohue, a junior who lived in Guthridge Hall last academic year, said the hall’s updates will improve the old, dusty floors that she found hard to clean throughout the year. “I find when I’m cleaning my room I can clean it as much as I want, and it still just looks dirty because of the chipped-off paint or the gross floors,” Donohue said.